Bespoke contemporary wooden furniture design, bespoke furniture maker Hampshire, bespoke cabinet maker Hampshire, UK. There is much talk today of "antiques of the future" in furniture making. However, very few makers of contemporary wooden furniture actually use the methods that allow for restoration or the development of patina, crucial for the long-term survival of your furniture. The methods and materials used a hundred and fifty years ago are very different to those commonly used to make today's fine furniture. A good look around a top antique shop and a perusal of some hundred year old books on cabinetmaking will soon highlight the main differences: glue, finishes and upholstery. Today's methods, based on factory techniques from the twentieth century, are not equivalent to those used to make fine antiques. Furniture made with modern glues cannot be disassembled for restoration and modern synthetic finishes tend to chip and flake off. And how little time does it take before a modern sofa is considered worthless and yet too toxic to burn? Are we building antiques of the future or next years' landfill? From ancient Egypt until the twentieth century, the glue of choice was made from animal skins and bones. Grisly though it sounds, this adhesive has superlative characteristics for furniture making. 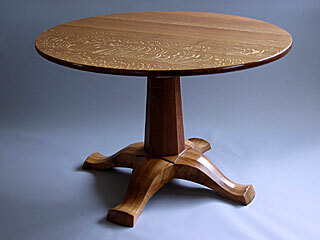 Moreover, it is the most fundamental part of making restorable furniture because it is reversible. Furniture can thus be disassembled for major repairs, unlike furniture made from modern synthetic glues, such as PVA (polyvinyl acetate) and epoxy resin, which are not reversible. Despite this, animal glue is rarely encountered in today's furniture workshop. However, I use animal glue for all my work. Modern finishes are, also, not used on my furniture. Shellac (the essential ingredient of French polish) and raw linseed oil are used extensively in my workshop because, again, they are known to give good service over the very long-term. Indeed, their track record spans centuries. They even have the delightful characteristic of slowly wearing away to reveal smooth shiny areas instead of flaking away or looking scuffed. They develop a pleasing patina instead of needing to be refinished. And don't think that traditional finishes are ineffective; the white rings and worn out finish often seen on Victorian furniture are often the result of poor quality finishing. Shoddy work was done then as well as today! Traditional finishing is an art form that takes years of training and calls for the best materials. The results are durable, beautiful and functional. Furthermore, consider the upholstery on the modern dining chair: a piece of chipboard with a layer of foam stapled to it. While this may seem satisfactory, it will usually flatten and feel disappointing within a year or two. A traditionally upholstered drop-in seat, using webbing and curled hair, retains its springy comfort for many more years. Sprung stuff-over dining chairs last even longer and maintain their comfort for decades. 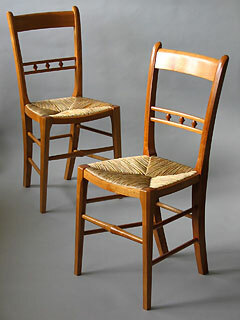 And rush seat chairs, again, if done skilfully, can also outlast the original purchasers of the furniture. Indeed, chairs made in the latter part of the nineteenth century often arrive at the restorers for reseating for the first time. A hundred years' of use! Finally, my furniture is also excellent value for money. Construction, materials and finish are optimized for each piece of furniture keeping costs to a minimum. It may still cost more than you usually spend on furniture but you won't be buying it twice. To my mind, that is what good furniture is all about. Whether you are looking for dining chairs, tables or cupboards, this furniture will improve your life forever. Traditional wooden Christmas tree decorations are available in a variety of English timbers. These wooden Christmas tree ornaments have a fine finish and are made from select pieces of attractive hardwoods. Please get in touch or visit the Bishop's Waltham Country Market. I design and make wooden furniture to commission, and every now and then I produce something a little unusual. For example, this football rattle, which was made in a variety of timbers. It was very loud! The body is cherry, the cogs are from hornbeam and the clappers are ash. Please get in touch to discuss your ideas with me. Bespoke wooden kitchenware for the discerning cook is now available. Please visit the kitchenware section of this website for details. Keep things out of reach of your children with this spacious modern corner cabinet. It can be plain or pretty: you decide! Comfort comes as standard in this wooden dining chair. Traditional-looking yet contemporary, this dining chair will carry you through your longest dinner parties. Take a look at my range of bespoke piano stools. Available in a range of styles and finishes to suit you and your piano. Large (40–50 cm diameter) wooden wedding cake cheese boards can be made for that special day. Please see kitchenware section for details. Copyright and Design Rights © 2018 John Tuffrey. All rights reserved.